With new waves of millennial shoppers navigating the marketplace, speed prevails as the primary differentiator in the consumer packaged goods (CPG) industry. In the 21st century, CPG companies without an effective digital capability are at a high risk of stagnation, loss of share, and even shrinking sales. Solution providers focused on delivering technologies for the CPG ecosystem are embracing digital commerce to help users better identify consumer preferences and trends, optimize their product assortment, deliver personalized marketing messages, refine pricing and promotional strategies, and connect with target consumers. With information becoming the lifeblood of the CPG industry, organizations are investing heavily in the right tools and the talent to extract analytic insights. This has allowed companies to consistently apply analytics to make decisions across the company–from the boardroom to sales force. As the demand for technology solutions to enable data-driven decision increases, there are a plethora of technology solution providers in the marketplace to address the new paradigm of the CPG industry. With this market opportunity in mind, there are ample of solution providers enabling insurers of any size to gain the market speed, responsiveness, customer focus, and operational excellence that today’s intensely competitive CPG market’s demand. 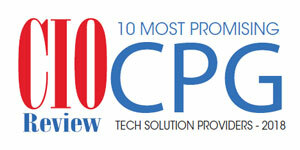 Our editorial team evaluated several of these companies to present you CIOReview’s “10 Most Promising CPG Tech Solution Providers – 2018.” We believe this information will help you, while you get prepared to develop and implement new processes, technologies, and tools to improve future business processes.